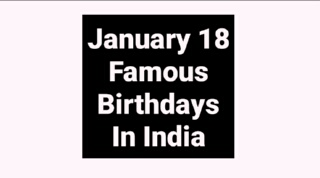 In this post you will know -- Famous Birthdays January 18 Bollywood Actor Actress Cricket Politics, check who are sharing your birthday in India -- 18 January's famous birthday personality in India like Bollywood actor, actress, cricketer, politician and all famous Indian celebrity stars. January 18 famous birthdays in India. Minissha Lamba (born 18 January 1985 is an Indian actress who appears in Bollywood films. Her notable films include Yahaan, Bachna Ae Haseeno, Kidnap, Shaurya and Well Done Abba. Minissha Lamba went to school at Sherwood Hall School and later on moved to Chettinad Vidyashram, both in Chennai. In 2004, she majored in English with honours from Miranda House, University of Delhi. Monica Bedi (born 18 January 1975) is an Indian/Norwegian actress, television-presenter, television-contestant. She debuted in Hindi films in mid 1990s. Bedi was born to Dr. Prem Kumar Bedi and Shakuntala Bedi on January 18, 1975 in a village named Chabbewal in the district Hoshiarpur, Punjab. Her parents migrated to Norway in 1976, when she was 10 months old where they run a garment business. (January 18, 1952 – October 18, 2004) commonly known as 'Sandalwood Veerappan , was an Indian dacoit active for a period of years in a broad swath of land covering 6,000 km² in the states of Karnataka, Kerala and Tamil Nadu. He long defied three state governments and Indian Border security paramilitary forces, maintaining at one point a small army numbering in hundreds. Vinod Ganpat Kambli (born 18 January 1972, Mumbai, Maharashtra, India) is a former Indian cricketer, who played for India as a middle order batsman, as well as for Mumbai and Boland, South Africa. He is childhood friend of the Indian cricketer Sachin Tendulkar. Currently he appears as cricket expert and commentator on various television channels. Jagadeesh Arunkumar (born January 18, 1975), in Bangalore, Karnataka, is an Indian first class cricketer who plays for Karnataka. He is a right-handed opening batsman. He has over 100 first class games to his name and 20 hundreds. He has previously represented India on Under 19 tours of South Africa and England. Aparna Popat (Gujarati: અપર્ણા પોપટ; born January 18, 1978) is an Indian badminton player. Aparna Popat was born in Mumbai, Maharashtra into a Gujarati family of Lalji Popat and Heena Popat. She studied at the J.B.Petit School in Mumbai, and her Pre university from Mount Carmel College, Bangalore. Aparna also holds a Bachelors degree in Commerce from the Mumbai University. Mariano Barreto (born January 18, 1957) is a Portuguese football manager. His last job was an assistant coach in the Russian Premier League with FC Kuban Krasnodar. Barreto was officially registered as head coach of Kuban because Sergei Ovchinnikov, who really managed the team, did not own a UEFA Pro Licence.